While devouring the latest issue of Lonny, I fell in love with Christy Ford's home. She is one of the creative masterminds behind And George and I have so enjoyed reading all their press lately. 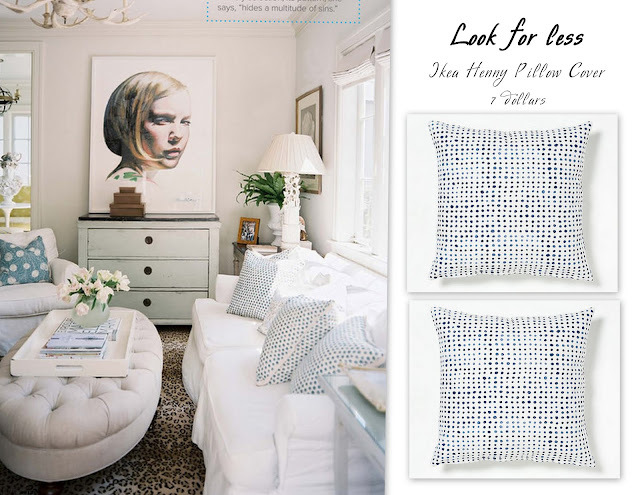 Her polka dot pillows caught my eye. They are $395! If you want a look for less, the Henny pillow covers from Ikea are a close match. I have a few tossed on our sofa right now and love 'em. Seriously love this pattern -- great find! Love this, but I could never pull it off. My dog loves to mess up any white or sparkly furniture, but great find! I so wish there was an ikea that was within 6 hours of me. Oh the trials and tribulations of being in a rural place! I might pay you to get some of those beauties for me!